Karachi is a city of 25 million. It attracts people from across Sind and across Pakistan who dream of building a better future for themselves and their families. Opening The Nest I/O, an incubator and startup space in Karachi, is intended to help some of these young dreamers turn their dreams into reality. Across Asia home-grown technology companies have been seen to expand and succeed. While there’s been amazing growth of the Pakistani startup community in recent years, there’s still a great deal of potential that remains untapped. When recent local-born innovations and startups like Convo, Eyedeus Labs,The Markhor and RemoteInterview.io pave the way and flourish in local and global markets, it gives hope to other young people in the tech community who aspire to start and run their own businesses thus creating value for themselves, jobs for others and much-needed wealth for the country. 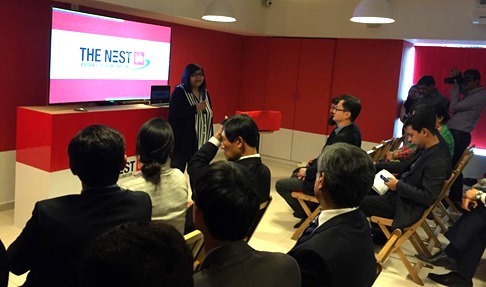 By opening The Nest I/O, the Pakistan Software Houses Association for IT & ITES (P@SHA), in partnership with Google for Entrepreneurs and Samsung and with support from the U.S. State Department, is expanding its support to the Pakistani tech startup community. This was the combined message emanating from the speeches made by Ann Lavin, Head of Public Policy at Google Inc Asia/Pacific, J.H. Lee MD of Samsung Pakistan, Brian Heath US Consul General Karachi and Jehan Ara President of P@SHA at the launch event of the vibrant and dynamic startup space this evening. The Nest i/o’s 6,500 sq ft of physical space will provide a home for entrepreneurs where they’ll have access to mentors, training and community events as well as access to current technology platforms and products for developing and testing. Showcasing innovative products to potential investors and customers is also a part of the vision of the new tech incubator. In their first year of operation, The Nest i/o plans to support over 50 residential startups, provide support to dozens more externally incubated startups and provide a community space that will create an impact for hundreds more. As part of the Google For Entrepreneurs global community, this hub will be able to provide startups in Karachi the opportunity to freely sit and connect with over 30 startup hubs around the world from Campus London to iHub in Nairobi and avail of the expertise of tech experts from the Samsung and Google network. It is hoped that The Nest I/O will provide the needed support to Pakistan’s next wave of entrepreneurs. Interested startups can apply to http://thenestio.com.